Continuity mistake: After the boy's Noel-Coward-lookalike father says, 'Et les fruits? ', goes into the kitchen, and disappears out of shot, watch the cat on top of the bookcase to the left of the door. Before the boy runs into shot, the cat suddenly changes position and a mysterious lens flare appears on the right of the screen, showing that it's actually two shots edited together. Man in Street: Little devil. Juvenile Delinquent: I'm an unstable psychotic individual with perverted tendencies. Antoine Doinel: Sir, it's my mother. Petite Feuille: What about her? 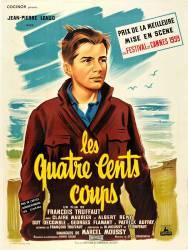 Antoine Doinel: She's just died.